Sandwiched between Malaysia and Australia is the Southeast Asian nation of Indonesia that features countless islands and a dynamic, diverse group of cultures and languages. 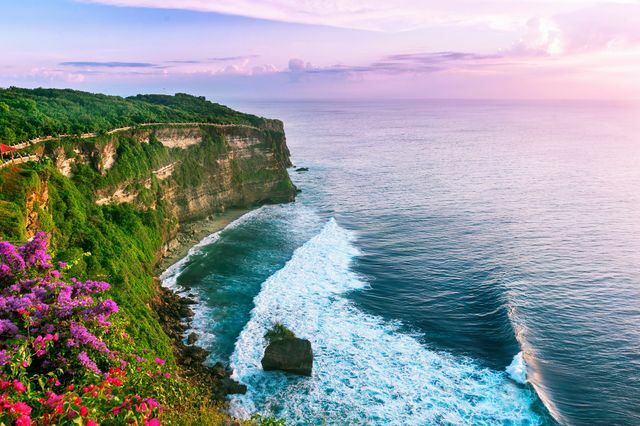 Most notably famous for scuba diving and its most popular destination—Bali—this lusty spot on the map makes for a romantic and warm honeymoon. Depending on where you tour, you might spot wildlife, like elephants, orangutans, tigers, or natural formations you can’t witness in many places of the world, like volcanic islands. It also helps that Indonesia tends to be far less expensive than other South Pacific beachy getaways—say, like Fiji—making it a far more affordable option for wanderlust couples who happen to be on a budget. If you’ve got your eye on this cornucopia nation, consider this your guide to booking the tickets and planning your Indonesia honeymoon escape. There are only two times of climates in Indonesia: dry and wet. If you want to have the warmest, happiest temperatures with very little rainfall, it is best to visit Indonesia between May and September. However, if your schedule only permits you to visit when the climate is considered wet—between October and April—don’t fret. While it is nicknamed the ‘monsoon’ time of year, that isn’t necessarily accurate, considering it is more about strong gusts of wind than torrential rainfall. These months you’ll likely see a few showers throughout the day, but plenty of sunshine, too. No matter when you visit, remember it is a tropical climate, so humidity is high, meaning you’ll definitely want lighter clothing and the option to turn on AC in your honeymoon suite. This small island is part of the Lesser Sunda chain and has one very special guest on its land: the 3-meter long Komodo dragon monitor lizard. Yep, that’s right: if you have a thing for reptiles (or you love Game of Thrones)—you definitely have to witness this creature in person. While you’re here, you can swim on pink beach or tour through the national park, keeping an eye out for your lizard friend. While in the park, you’ll also see lush forests, volcanic hills and savannahs. Many divers love the reefs here, so if you’re certified, make time to dive in at Merah Beach, Tatawa islands or Batu Bolong. When you image the dreamiest island you’ve ever scrolled through on Instagram—it probably looked something like this. This province encompasses central and southern Maluku Islands, with the Banda Islands at the center. Here, you can see an active volcano, stroll past Colonial buildings and munch on local fare. If you’re into diving, make your way to Ambon Island, where plenty of reefs reveal a new world under the surface. Active twosomes will enjoy hiking through various mountains and then relaxing on the pretty beaches, where cabanas—and cocktails—are plenty. You’ve seen snow-covered mountains and ones ripe with pine trees—but what about a rainbow range? 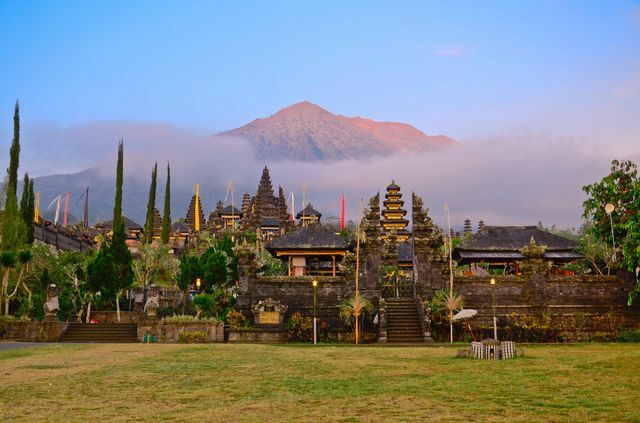 When you head to this region in the eastern part of Java, west of Bali, you’ll see a unique terrain. Not only do you have protected jungle and marine life, but you can also scale a volcano, and watch its crater that creates natural blue flames. Always wanted to walk next to baby turtles? You’ll see plenty as you safari through the Baluran National Park. Though there aren’t as many luxury options in this part of the world as in others, being full immersed into a biosystem that is vastly different than any others you’re used to will create a one-of-a-kind honeymoon. We hate to break it to you, but in terms of beaches, Bali isn’t exactly the top pick. While it features plenty of pretty sunsets and cheap rooftop bars, other Indonesian islands offer more breathtaking experiences with the Indian Ocean. If you’re venturing to Bali for part of your honeymoon, your time, money and energy is better spent in Ubud, in the uplands. Here is where much of the culture of this friendly island nation was founded, giving you the opportunity to experience their food, crafts and dance. As you trek through the terraced rice paddies and rainforests, you’ll come face-to-face with Hindu temples and healers, offering you a blessing for your new marriage. You can also tour ancient holy sites, hang out with monkeys in a preserve and much, much more. Best of all? High-end, luxury suites won’t cost you more than $100 a night—often with a private pool. Hi Ladies, been following the forums for a while. Has anyone visited Bali for their honeymoon? If so where did you stay? What did you do?